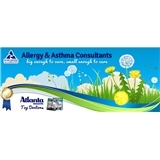 Allergy and Asthma Consultants, PC (Lilburn) - Book Appointment Online! Welcome to Allergy & Asthma Consultants! At Allergy and Asthma Consultants, we are committed to providing our patients with compassionate, state-of-the-art medical care in a warm and friendly environment. We certainly aren’t the biggest allergy practice in the metro-Atlanta area, but we feel that we are the best! Starting with your very first phone call which is answered personally by one of our highly trained front office staff you will realize that serving our patients is our top priority. Our patients consistently tell us that they feel like “family”. In fact, our staff has 219 combined years of service-an average of almost 13 years per employee! You will usually see the same office staff from visit to visit, at any of our 5 conveniently located offices, putting you at immediately at ease. Our goal is to make your quality of life the best that it can be! At Asthma and Allergy Consultants, we are…big enough to cure…small enough to care! He was great explained everything. Talked to my son as well made him feel apart of what was going on. The staff was wonderful and out him at ease with the testing.